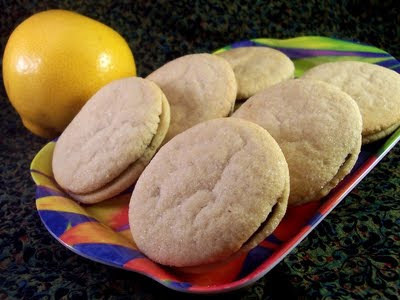 This month's challenge offered the choice of adapting one or both of two delicious cookies. Time constraints and generalized chaos made the decision for me, leading to one elegant, deceptively simple confection. Mix soymilk and lemon juice in a nonreactive container, i.e. Pyrex measuring cup, and set aside. Sift dry ingredients together in a small bowl and set aside. Cream margarine and sugar together in a mixing bowl until fluffy. Add soymilk mixture and vanilla, then beat until combined. (Don't worry if it develops a cottage cheese texture.) Continue to beat while gradually adding the flour mixture until completely combined. Stretch out a three foot sheet of cling wrap on the counter. Turn dough out onto the wrap and carefully work into a cylindrical shape about 1 inch in diameter. Roll in the cling wrap and place in refrigerator overnight. Preheat oven to 350°F. Line cookie sheets with parchment paper. Unwrap dough and cut into 1/4 inch slices. Dip one side of cookie in granulated sugar, and place on cookie sheets two inches apart with sugar side up. After filling cookie sheet, use a glass with a concave bottom to flatten cookies. Bake 8-10 minutes. half of the zest from one orange. Place zest and chocolate chips in a small bowl. Heat coconut milk in microwave until bubbling. Stir coconut milk into chips and zest until smooth, fragrant, chocolaty mixture achieved. Resist urge to bypass cookies and stuff directly in face. Commence with the sandwich making. Match up the cookies into pairs and spackle them together with orange chocolate decadence. They hold a surprising amount of filling without squishing out. The result wasn't quite as delicate as the original Pepperidge Farm Milanos, but these cookies are worth the effort. Thanks to Nicole for great challenge! I totally agree on the tuile badness! Some things just need eggs. My memory was too short I guess, and I actually repeated my tuile disaster before deciding on a sugar cookie too! They look great! I used egg whites in the Milanos and still fought with the batter. You made a wise choice. Good idea with altering the recipe. They look yummy! I did the mallows, which were fun.